Plus Size Kitten: Got my Free Mireica Sample & Vouchers! Update: I receive my Mireica samples today by normal post. The letter says what's Mireica and the benefits and the places it's available at (pharmacy such as Guardian, Watson's, Vitacare, Caring & other independent pharmacies) and retails for RM178 for a pack of 30 sachets. 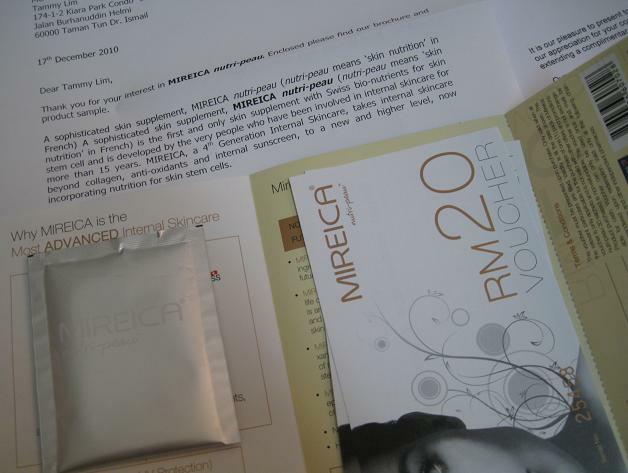 I receive 3 x RM20 voucher, each voucher can use to rebate off 1 pack of 30sachets Mireica. Also the sample is actually 1 sachet of Mireica only which I guess is enough for us to try the taste :D thanks Mireica! Click here to find out how to get it for free. Mireica nutri-peau is a nutri-cosmetic fortified with stem cell extracts, to harness the regenerative potential of your own skin stem cells to renew skin and make it look young again. Developed by LiveLife BioSciences A.G. I was excited to find this site. I needed to thank you for your time perusing this heavenly! In truth I delighted in every piece of it and I've recognizable to ensure that the blog entry fairly creative.Thank you for posting.